Today’s blog is moving away from our usual fun fudge recipes and focusing more on the very core of Calico Cottage which is helping you to start your own fudge business! When you were a child did you ever walk into a sweet shop and imagine yourself owning your very own one in the future? I think most of us probably did…. If you have been lucky enough to fulfil that dream then you will know that the problem with sweet shops nowadays is there are an awful lot of them around. Consequently, to be successful you need to really stand out from the crowd. Calico Cottage offers you the chance to do this with our bespoke in-store profit generating fudge programme. With the Calico programme you can make your own delicious range of freshly made fudge on site and sell it under your own name for five times cost! It’s suitable for all sorts of businesses whether you’re a little gift shop or a large tourist site. We can accommodate most locations and if we don’t think it will work, then we will tell you. After all, we pride ourselves on our honesty and customer service. First and foremost it’s important to point out that we are not trying to sell a franchise so you won’t face any of the usual fees which occur. What we are actually selling is a complete fudge making system; a machine for making the fudge known as a fudge kettle and then the fudge mix, which consists of pre-measured ingredients and goes in the fudge kettle to produce a variety of fabulous flavours of fudge! 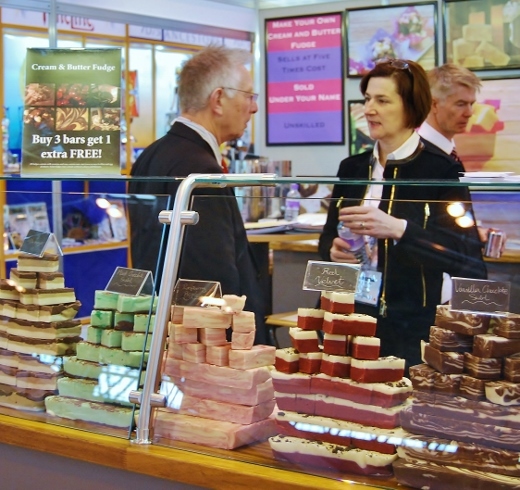 Including in the programme is also our training and expertise so that you can be confident you have all the skills you require to run a successful fudge business. One of the questions we often get asked is “so what happens if I buy your programme? I just hand over the money and then fend for myself?” No, is the straight answer. We only make money if you continue to buy fudge mix from us but you will only need to buy mix if you are selling lots of lovely fudge! The fee for setting you up with the equipment and initial training merely covers our costs. Our primary aim is to help you sell as much fudge as you can so to better your sales figures year on year and thus continue to buy fudge mix from us as this is the only way we make money! The next question after that is “is it difficult?” and again, the answer is NO! It is designed to be low skilled and efficient. Making the fudge is the easy bit, the slightly trickier bit is making sure you have a beautiful stand out display to catch everyone’s eye but we can help you with that bit too so don’t worry. If you think your store or site could benefit from its own tasty range of fresh fudge and you would like to know more then have a look at our Fudge and Your Business Page here or read some of our customer stories. Alternatively, give us a ring on 01353741661 with any enquiries. We'd love to hear from you!